This card is definitely not for every deck. In the right deck, mainly a Deck Destruction deck, this card is almost a must. What is this Deck Destruction that I speak off? Right now, you can use cards like Gravekeeper's Servants, Card Destructions, and maybe even Bistro Butchers to deck your opponent. With Morphing Jar #2, the deck just got a lot stronger. Just in case you didn't know, it's going to be semi-limited to 2-per-deck soon. Add a couple of Spear Cretins and Shallow Graves to re-use both Cyber Jar's and Morphing Jar #2's effects over and over again. Again, it's not for every deck. In the right deck, it's amazing. Introduction: Hahhaha you lose all those magic and traps cards! Position. Any other cards picked up are discarded to the Graveyard. disputed because of it's name. But I won't get into detail of that just yet. which is a bit bad. However, this card still has potential to be deadly. This cards works best in those Deck Destruction decks :-). 3.3. It has a lot of potential to be deadly, but can be a bit hard to use. Conclusion: Morhpling Jar #2, What kind of stupid name is that? Today we look at one of the wierder cards from Pharoah's Servant, morphing jar #2. This card, in my opinion, is the one of the most fun cards to play. (The first being fiber pod, which will be released later. No doubt the name will be butchered) It takes all monsters on the field and shuffles them back into the deck. Then the players draw cards until they get the same amount of level 4 or less monsters as was shuffled in and then are put in face down defense. This card is great for defense. Let's say the opponent is stacked with monsters and you have nothing. Then you play this card. When they attatheirll thier monsters are returned to their deck and then their battle phase is over since they cant attack. 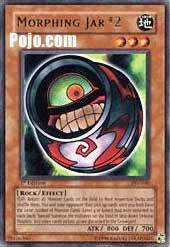 (By the way, the Morphing Jar is not returned to your deck if it is destroyed by the attack.) Not only that, but it is great for deck destruction decks. You can seriously cut a large part of the opponent's deck if they had 5 monsters on the field or if they dont have any level 4 or lower monsters coming out soon. Great for annoying the opponent. I give this card a 3.8/5. While a good defense for a turn, it's only good for 1 turn as those monsters will probably be flipped next turn. Look for this to be restricted to 2. IQ I haven't heard from IQ yet, but he's pretty dependable, so let's keep his mug up for a while.